On a cold February day in 1979, when most of the Northeast was snowed in by a blizzard, NASCAR entered the American consciousness with a dramatic telecast of the Daytona 500. It was the first 500-mile race to be broadcast live on national television and featured the heroes and legends of the sport racing on a hallowed track. With one of the wildest finishes in sports history - a finish that was just the start of the drama - everything changed for what is now America's second most popular sport. HE CRASHED ME SO I CRASHED HIM BACK is the story of an emerging sport trying to find its feet. 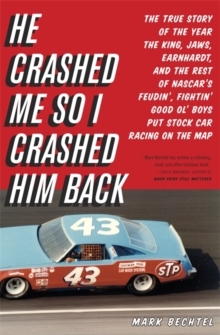 It's the story of how Bobby Allison, Donnie Allison, Cale Yarborough, Richard Petty, Dale Earnhardt, Darrell Waltrip, A.J. Foyt, and Kyle Petty came together in an unforgettable season that featured the first nationally televised NASCAR races. There were rivalries -even the sibling kind - and plenty of fistfights, feuds, and frenzied finishes. Rollicking and full of larger-than-life characters, HE CRASHED ME SO I CRASHED HIM BACK is the remarkable tale of the birth of modern stock-car racing.